For 2018, an expansion has been completed to create a new architecturally designed living space with complete central air conditioning system throughout the home (photos to come). The dining room will have seating for 6. The new living room, will have picture windows throughout, allowing views of the sunset and beautifully landscaped setting. There is a large flat screen Samsung SMART TV with choices of cable, Netflix, and DVD system. The kitchen, which has seating for 3 at the Granite counter, is fully stocked with all the pots and pans you will need, including baking equipment, coffee maker, Keurig machine, microwave, toaster oven, etc. Each bedroom is outfitted with their own Samsung flat screen TVs and cable. The home has a wonderful new large Azek rear deck with Pottery Barn Teak furnishings and space for everyone. The deck leads onto a brick patio complete with a teak dining table, grill and outdoor fire pit. Right off the deck is a new outdoor shower. The front porch has seating and is a wonderful space to take in the picturesque meadow directly across from the home, sunsets or star gazing. 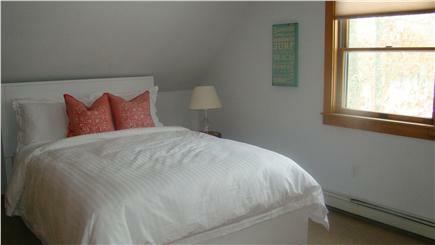 Centrally located to Edgartown, Vineyard Haven and Oak Bluffs. Just a short drive will take you to any of the town beaches and the Sailing Camp Park is a quick bike ride away. The home is located on over a 1/2 acre of landscaped property in a beautiful, private, neighborhood and is great for families, friends or even a romantic getaway. The community is exclusive to guests and is tranquil and quiet. The bike path and bus route are located right off of the community and is a breeze to get to. Within a very short walk is the State Park with excellent trails to explore. Martha’s Vineyard has been a great vacation location for years and there is lots to do, including gorgeous beaches, fine dining, shopping, golf courses, tennis courts, deep sea fishing, sailing, kayaking and much, much more. Additional availability info: Check in and Check out is on Saturdays. All rentals must be within those days. Additional pricing info: There is a cleaning fee and a security deposit required, State and local taxes of 11.7% will apply. 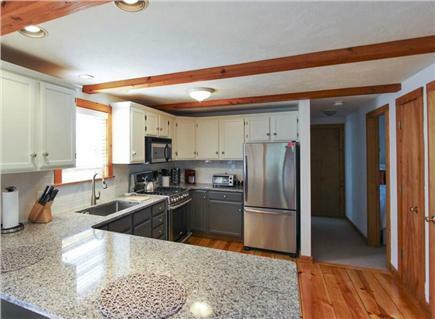 This home is very lovely, quiet and spacious! All of the appliances are modern and in good working order. You will spend most of your time on the beautiful deck enjoying friends and family or having coffee, lunch or dinner there. They added a spacious sitting area this past year, which made for a fun yet cozy place to watch TV, play games and enjoy family time. It’s only a few minutes from the airport and about a 15 minute drive to Oaks Bluffs downtown and the beach. All of the bedrooms are spacious and well appointed. The ceiling fans and AC units kept the home nice and cool on those hot MV days. We are so lucky to have wonderful guests like you returning year after year. We know how much you enjoy the property and amenities. We are happy that you love the new space and central A/C. Until next time, enjoy!! So happy you enjoyed your time. We received your request for next year and have penciled you in! We are looking forward to next year. Wonderful home, peaceful and relaxing. 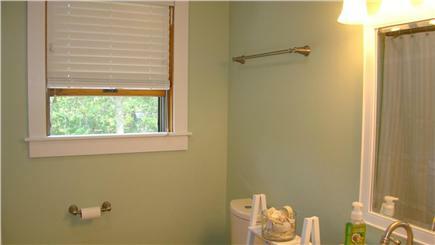 House is well maintained, spacious, and beautifully designed for a comfortable stay. Large deck and bonus outdoor shower is a plus! Close to restaurants, beaches, bike trails, and many other activities. Great place to stay! I love staying at this property! Very quiet and secluded but near all the things we love about the Vineyard. The house is well appointed and quaint. I especially love the outdoor shower--I use it even when we haven't been to the beach. The house is the perfect size and it's great that the kids (or kid in my case) can be on a different floor than the grown ups. I hope to return for the third year in a row! Thank you so much for your review. We are so happy that you have enjoyed the property, and we love having you as a guest. We think that you will really love all the updates for 2018, including the new living space and expanded deck! The outdoor shower, although it is already great, will be updated as well. Hope all is well and look forward to having you as a guest again. This was our second year staying at this property. We absolutely enjoyed the outdoor sitting areas, the cool breezes on the patio, and the landscaped surroundings. It looks small from the outside but the 3 bedrooms, 2 baths and upgraded kitchen are very well appointed and very spacious. 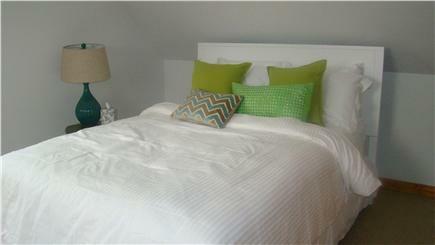 The upstairs bedrooms have air conditioning which we only used late in the day.There was no need to use A/C at night. 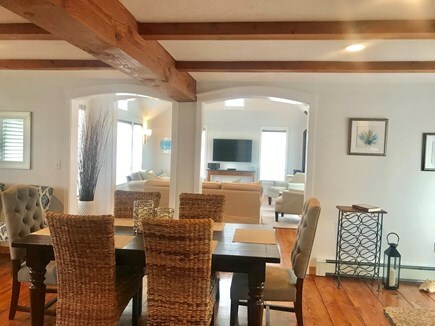 There was plenty of room for five guests and excellent owner amenities including a Welcome manual, guides and maps to MV locations, free internet and wi-fi. 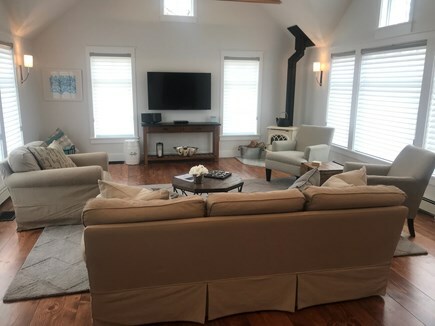 This location is accessible to bus service, bike paths, shopping, the beach, and Oaks Bluff, Edgartown, and Vineyard Haven. Janet, thank you for the review. We are so happy that you returned this year and that you have enjoyed the property once again. As you know, we are always adding new amenities so that whenever guests return they are treated to a little something different and will be doing so again next year. We love making our guests happy and to help them feel that they are truly on vacation! It was our pleasure to have you in our home. Thank you for allowing us to rent your beautiful home again this year. We loved that you constantly are updating and making the home more enjoyable each year. We love the new planting and, of course, the grounds. What a comfortable home! We appreciate all the work that you have put in to make this home a destination. We will surely be back next year! Thanks again for allowing us to rent your beautiful home. It's incredibly well-appointed, in a super location. We had a great week there and will happily recommend it to others. Chris and his family have been vacationing on Martha's Vineyard for many years. They believe that vacationing should be an unforgettable experience. 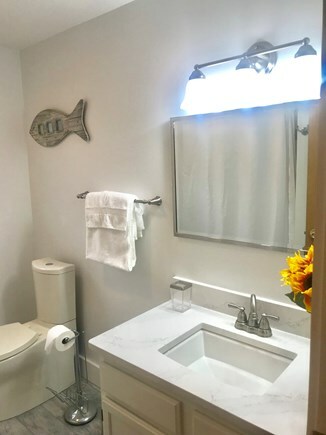 They strive to constantly update their home to make it comfortable, clean, well appointed and a place renters want to return to year after year. In fact, many of the renters have returned multiple times and have raved about their experience. The home is situated in a incredibly quiet neighborhood with exclusive access to guests. 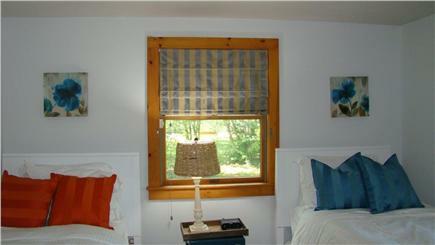 Across from the home is a large meadow providing a unobstructed view. It is easy to forget that there are any other homes around you. The location is fantastic and you can get to any location on island easily. The home is extremely clean and freshly updated every year. For 2018, the new expansion has really upgraded the home even further. The last renovation was in 2014, and the new expansion is a testament to the owner's commitment to improving the home year after year.